In May, the A. B. Freeman School of Business celebrated the largest graduation in school history, awarding diplomas to more than 1,000 graduates. On June 5, 1918, Tulane University’s College of Commerce and Business Administration celebrated its inaugural graduating class in a ceremony at the French Opera House on Bourbon Street. On May 18, 2018 — nearly 100 years to the day after that historic ceremony — the A. 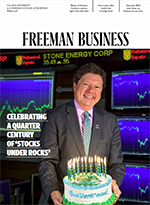 B. Freeman School of Business awarded diplomas to more than 1,000 graduates. It was the largest graduating class in Freeman School history, and the first since the opening of the school’s new building in January 2018. The Undergraduate Diploma Ceremony kicked off the day’s festivities at 10 a.m. in the Avron B. Fogelman Arena in Devlin Fieldhouse. More than 500 prospective graduates of the Bachelor of Science in Management program marched across the stage to receive their diplomas. 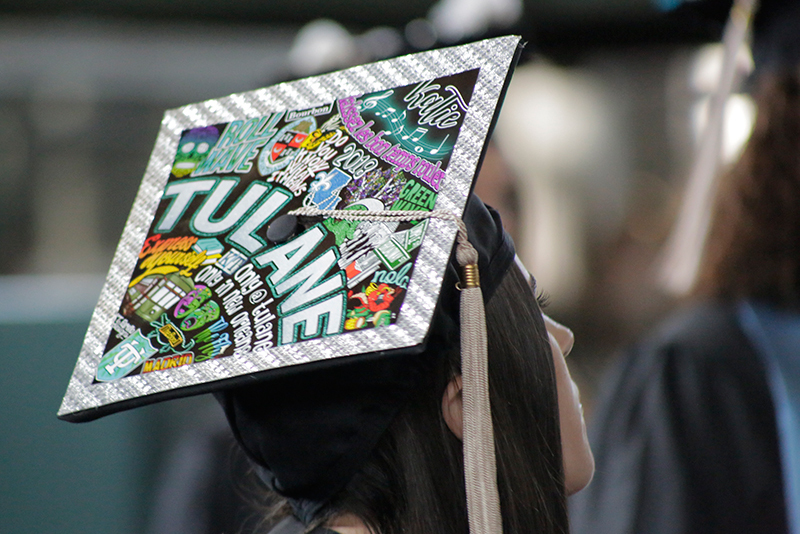 Their degrees were officially conferred the following day at Tulane’s Unified Commencement Ceremony in the Mercedes-Benz Superdome. Sarah Dianne Lawhorne received the BSM Scholastic Achievement Award, which recognizes the graduating BSM student with the highest cumulative grade point average. Lawhorne and Manolo Jose Baca Pallais received the Evelyn and William Burkenroad Award, which is chosen by the senior class based on scholarship, personal integrity, and contributions to the professional, social and academic quality of the business school. Luca Piero Alessandrini, Rachel Diane Budd, Lawhorne and Patrick Alexander Madden received the Tulane 34 Award, which is presented to 34 graduates from across Tulane in recognition of their academic achievements, student leadership and community service. In addition, Christopher Joseph Loomis and Meghan Kayli Marks received the Dean’s Service Award, Avijita Panwar received the Tulane Association of Business Alumni Award, and Lawhorne and Benjamin Cornelius McManus received the TABA Community Service Award. The ceremony was followed by a reception for graduates and their families in the Goldring/Woldenberg Business Complex’s Marshall Family Commons. Later that afternoon, the Freeman School honored more than 700 prospective master’s and doctoral degree recipients at the Graduate Diploma Ceremony, which recognizes graduates of programs including the Master of Accounting, the Master of Business Administration, the Master of Finance, the Master of Global Management, the Master of Management, the Master of Management in Energy and the Doctor of Philosophy. That number includes candidates who completed their degree requirements in late 2017 and candidates who expect to complete their degree requirements later this year. The ceremony took place in the Avron B. Fogelman Arena in Devlin Fieldhouse. Mary Abigail Zanone Suquet received the Marta and Peter Bordeaux Scholastic Achievement Award, which recognizes the graduating Master of Business Administration student with the highest cumulative grade point average. Kelly Marie Harlan received the Roger L. Cornelius Award, which recognizes the graduating MBA who embodies the highest standards of business scholarship and leadership. Kristina Ann Crouch, Todd Wackerman and Sarah Anne Marie Wolochatiuk received the Tulane 34 Award, and Azuka Andre Onianwa and Robert Edward Edgecombe III received the Allen R. Vorholt Memorial Award, which honors graduates of the executive MBA program who demonstrate leadership, scholarship, the ability to balance priorities and a strong sense of civic obligation. In addition, Panwar, Crouch, Isabella Datoon Finnell, Harlan, Gregory Lee Tuttle, Brian Neil Guidry and Sean Dunderdale received the Dean’s Service Award. Zelong Zhang, Eleanor Brennan Davis, Danti Kalladathil Kumaran, Michael Weldon Massengale, Kristin Woanlin Lo, Trina Jane Beck, Jiayu Gu, Travis Dean Corgey, Micheal Craig McWilliams, Sara Eugenia Adoue and Reed Charles Wilson received the Tulane Association of Business Alumni Award. And Kristen Mele, Xinyue Luo, Brooke Alicia Barrios, Beck, Brandon Porter Cohen, Mairead Eileen Coogan, Isabelle Marie Duran, Edgecombe, Zuri Aisha Gracin, Kyle Zachary Gross, Erin Teresa Marrero-Savoie, Kathryn Mullins, Rachel Cheri Schatz, Tomi Malia Suzuki, Wackerman and Jintao Huang received the TABA Community Service Award. Following the ceremony, the Uptown Strutters Brass Band led a second line into the Lavin-Bernick Center for University Life for the annual Champagne reception for graduates and their families.